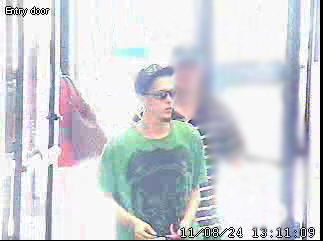 Windsor Police are seeking the assistance of the public after an elderly man was robbed downtown on August 24, 2011. The 73-year-old victim had attended his banking institution located at the corner of Ouellette Avenue at Pitt Streets, and had withdrawn a quantity of cash which he placed in an envelope and put in his pocket. He then exited the bank and walked eastbound on Pitt Street toward his apartment building located in the 200 block of Pitt Street East. When he reached the corner of Pitt and Goyeau he was approached by a man who asked him for his money. The victim refused and kept walking eastbound on Pitt. As the elderly man reached the doors of his apartment building, the suspect, who had followed the victim, pushed him to the ground and proceeded to reach into the victim’s pocket removing the envelope containing the cash. The suspect then ran southbound between Casino Windsor and the Provincial Court Building toward Chatham Street. The victim was not physically injured as a result of the robbery. The police investigation revealed that the suspect had been inside the bank observing the victim prior to the robbery and images of the suspect had been recorded on surveillance video. The suspect is described as a male, white, 18-23 years, 6’1″, slender build, short hair and clean-shaven. He was wearing a black ball cap, sunglasses, an oversized green T-shirt, 3/4 length baggy blue jean shorts and black high top running shoes. Anyone with any information as to the identity of the suspect is asked to call Windsor Police Investigations at 519-255-6700 ext 4830 or anonymously to Crime Stoppers at 519-258-TIPS (8477).